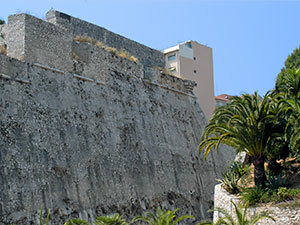 We disembarked quickly at Cannes, taxied to the train station, and returned to Villefranche and the Hotel Welcome. For four days, we just wanted to relax and unwind after two weeks of non-stop activity. 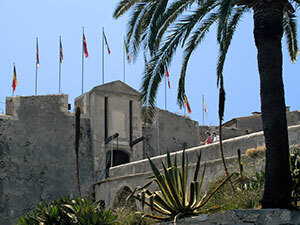 Fort St-Elme (Citadelle Saint-Elmo in French), built in 1557, is today the site of two museums and the town hall. 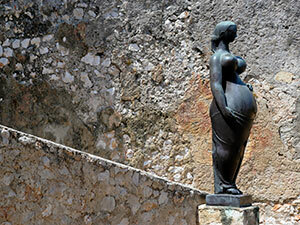 There is a collection of sculptures by Antoniucci Volti both in the open courtyard and an interior gallery; while in another, the paintings of Henri Goetz and his wife, Christine Boumeester, are on display. 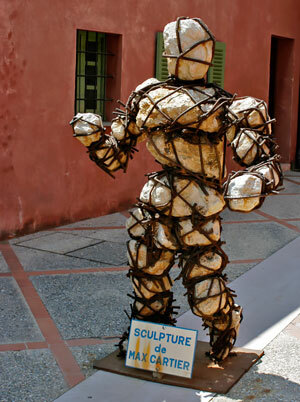 In a smaller courtyard outside the Municipal police office, stands a fascinating sculpture by Max Cartier, similar to one at the Nice airport. 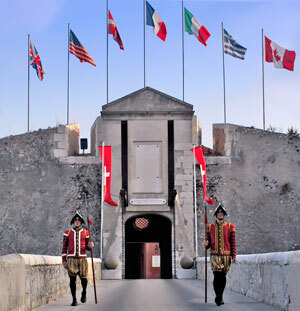 Each day at 5PM, when the citadel closes for the day, visitors can observe the changing of the guard, accompanied by martial music and a booming canon. 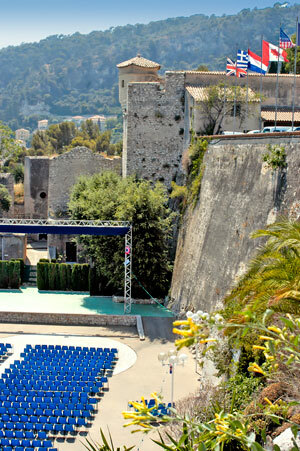 Just outside the citadel is an open air theater which shows movies after dark. This weekend's offerings were Chouchou, Hulk, and Charlie's Angles. Villefranche was mobbed on the weekend, especially in the harbor area just below our balcony. The crowds thinned a bit on the weekdays but it was, after all, July; and I'm told August would be worse. But it was wonderful for people-watching. The harbor was filled with boats small and large. Cruise ships anchored offshore and kept a constant flow of tourists coming into town. Expensive yachts were also anchored in the harbor, bringing their passengers ashore in small skiffs. Small, locally owned tour boats were hired for excursions up and down the coast. Other small boats, from coastal towns near and far, came in for the day. And, through it all, the local fishermen slipped off before dawn each morning hoping to return with a catch that evening. 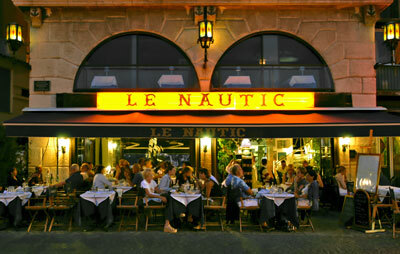 Restaurants were crowded, many of the better ones requiring reservations several days in advance. It was easier to get a table in some of the smaller restaurants in the back streets, but you still had to get there early to avoid a wait. Despite the crowds, one can find quiet spots in the old town. The baroque St Michael's Church stands in the Place de la Paix, a charming square. Inside the church is a wooden crucifix carved, it is said, from the trunk of a fig tree by a 17th century convict. Another quiet place is the Rue Obscure, a covered street where townspeople took refuge in times of trouble, most recently during World War II bombardments. Al bought a large poster by Razzia at Sunday's Marché de brocante in the Place Pollonnaise, and we were faced with the problem of getting it home. The vendor could ship it for a rather high fee, or we could take it on the plane as checked baggage. We chose the latter. The vendor sold us a hard plastic mailing tube which would protect the poster, so all we had to do was find tape for sealing the tube and labels for addressing. It worked beautifully and the poster arrived in San Francisco in perfect condition. I have mentioned the excessive heat from time to time. For the entire time we were in France, and for the previous six weeks, France and the region had been in a heat wave. Never before had I been so adversely affected by heat that on some days I had virtually no energy (although it didn't seem to slow down Al at all). Forest fires raged in the southwest. But the worst was to come after we returned home. In August, temperatures increased even more and Europe was hit by one of the worst heat waves on record. France suffered more than any other country, with 14,000 deaths, mostly elderly people. The resulting political scandal raged for months. 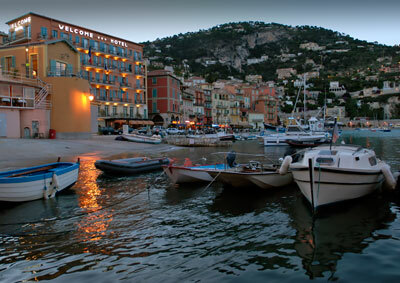 Villefranche is beautiful at any time, but especially at night. The lights in the town and the surrounding hills sparkle. With the day trippers gone, the frenetic activity of the mid-summer day eases and everyone seems more relaxed. To our delight, the neighboring town of St-Jean-Cap-Ferrat put on a booming fireworks display. We sat on our balcony at the Hotel Welcome and enjoyed the show for over 30 minutes. What a spectacular finish to our vacation.